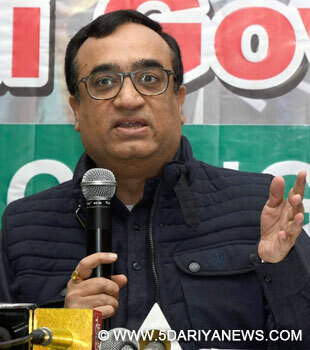 Congress leader Ajay Maken has said that Delhi Chief Minister Arvind Kejriwal is a "dream merchant" who is still in "opposition mode" and that the AAP government has failed to meet expectations of the people in several areas, including infrastructure, health and education.In an interview to IANS, Ajay Maken, 53, who is Delhi Congress chief, said that the Congress was on a revival path in the city and would perform well in the municipal polls later this year.Maken said Kejriwal shoots questions at others but rarely answers queries posed to him. "Kejriwal must understand that he is no more in the opposition. Gone are the days when he can run away after asking questions. He should answer questions of the opposition and of the people," Maken said. He said Kejriwal's Aam Aadmi Party (AAP) had won a huge mandate in the 2015 assembly elections by making tall promises and by negating the work of the Congress government in Delhi in 15 years. "Kejriwal came to power by weaving dreams. I call him a dream merchant. He made false criticism of the work of Congress governments led by Sheila Dikshit," Maken said. "Whether it is infrastructure, roads, health or education, the AAP government has failed. You won't find a single new flyover project initiated in the last two years. No new hospital has been started," Maken added.He said the number of buses run by the city's bus service DTC has come down in the last two years.The AAP government has blamed the central government for delaying clearances for many of its projects, including allotment of land for hospitals by the Delhi Development Authority. Maken also alleged that the Kejriwal government had not responded adequately when the city faced problems related to dengue and chikungunya.Referring to the third phase of the Metro Rail project, Maken said it was the first time that the corporation had missed its completion deadline. The Congress leader alleged that the Jan Lokpal Bill brought by the AAP government was "weak". "They said that they would end corruption, but has the promise been met? Many of their own MLAs and ministers have been booked by police (on various charges)," Maken said.Maken, who has been a minister in the United Progressive Alliance (UPA) government, alleged that the tussle witnessed between the central government and the Delhi government was "stage managed". "Much of the face-off is stage managed. It suits Kejriwal and (Prime Minister) Narendra Modi, because both of them have come to power by making tall promises. They have not been able to deliver on them," Maken said.He said the Congress was being strengthened "in a way that suits modern-day politics".The AAP had won 67 of 70 seats in the 2015 assembly elections while the Congress could not open its account.Maken said the Congress had suffered electoral defeats earlier too and will bounce back to power.